Under Review: EA SPORTS Active & a Giveaway!!! You start off the game by creating a profile for yourself. You can pick your hair color, outfit, accessories, body shape…all that jazz. You also get to choose whether you want a male or female trainer and what type of music you’d like to listen to. From there, the system, which includes the Wii game, leg strap and resistance band (which you have to annoyingly add the handles to), sets up goals for you and then shows you what the heck to do. For the exercises, you need your Wii-mote (the cuteness of that word never gets old) and its accompanying nunchuck. 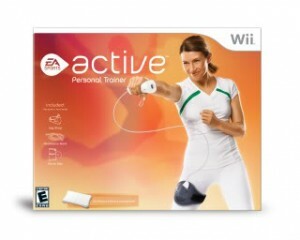 For some exercises, you use both the Wii-mote and the nunchuck. For others, you tuck the nunchuck—comfortably in your leg strap and hang on to the Wii-mote. The positioning of these two things help the game to know exactly where you are and how you’re moving as you run, jump, squat, row and punch your way to fitness. Oh, and if you have a Wii Balance Board, you can use that, too. There are tons of different workouts to choose from, including 20-minute circuits, 50-minute sports-themed sessions and even upper- and lower-body only sections. And if you don’t like any of those, you can customize your own workout. And my goodness are there a lot of options: cardio dancing (like upper-body Dance Dance Revolution, plus fun moves like The Lawn Mower and the Shopping Cart! ), tennis, inline skating (a serious thigh burner-outer), running drills, traditional strength exercises with the resistance band, lunges galore, high knees, twists, volleyball, baseball, boxing…the list goes on and on. And get this…it’s FUN. Like most workouts, your stationary strength exercises aren’t going to get your heart pumping too hard, but the squats, lunges and cardio that are favored in most of the programs do. I worked up quite the sweat in the 20-minute hard-intensity interval workout and was even sore the next day from all the jumping and punching. And, if you’re really looking to be pushed, they have a built-in 30-day challenge for you that is backed by Oprah’s PT Bob Greene. Not to mention that you’re constantly being rewarded and complimented for your hard work and dedication. As you work out on the system, you earn trophies and each workout is saved so that you can go back in and review your progress and calories burned. I seriously spent hours playing around with these features and taking the game’s fun nutritional surveys and quizzes. And although the music is a tad cheesy, I kinda loved it. It pumped me up, in a goofy sort of way, which is what you need when punching the air with ferocity. The only negative comments I have about the game have pretty much been addressed by the EA SPORTS people because there are so many ways to customize the game (they deserve a medal, btw). The male trainer is pretty annoying, and although I suggest going with the female trainer entirely, if you do use the guy, there’s an option in the settings to reduce his cuing to a minimum or hush him up entirely. Also, in some of the exercises, especially the strength ones, the pacing is almost painfully and awkwardly slow. As someone who is used to moving on the beat, it’s hard to wait for three counts before doing another backward lunge. However, again in the settings, you can change the intensity to make the trainer speed things up a bit, making the whole exercise more fluid and natural. There are still some odd pauses here or there, but, hey, no one is perfect. My only other complaint would be that the resistance band is really easy. If you’ve been working out regularly, don’t even bother to use it. Grab a medium or hard one from home (or from Amazon), and get to lifting! If you’re dying to try this game yourself, we’re happy to announce that EA SPORTS Active has agreed to give away a copy! Score! To enter, all you have to do is tell us in a comment or in an email to contact@fitbottomedgirls.com by July 2 why you need this game. U.S. residents only, pretty please! *No marriages were ruined due to this game.